My right thumb is pushing the right stick on my transmitter hard to the left while my left thumb is pulling back on the left transmitter stick. My 240 is now pulling hard on the # 1 pylon pole. My knees are knocking……………. yes I can remember it all . It was in the spring at a pylon race in Macclenny , Florida. 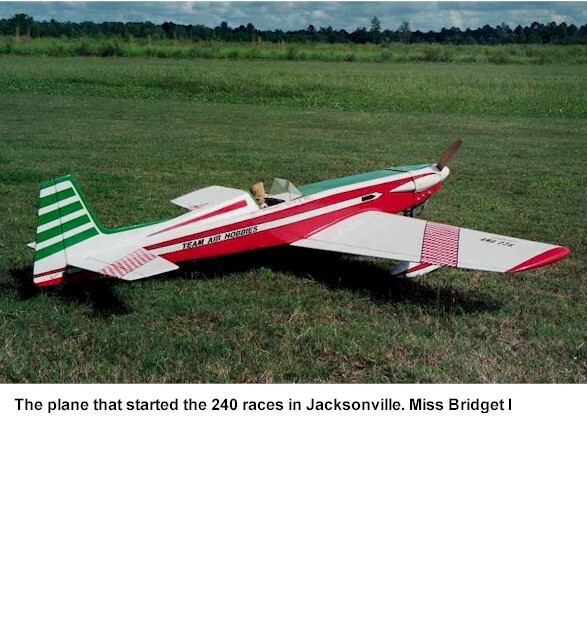 We were flying in an event called Open Class II, for planes 80 inch and having engines 1.8 and larger.. As I continued flying the plane called Miss Bridget, a new design by Top Gun fame Mr. Mel Whitley, others soon took notice of the 240. The group called the "Wednesday Lunch Bunch," the conversation got started on pylon racing that was starting in Madera California. Little did they know that I was in contact with my old and dear friend Cliff Weirick, who was involved with the new type of pylon racing that was soon to be tested in Madera Cal. We decided to start a new class of pylon in the Gateway R/C club based on the Sport 240. Some temporary rules were penciled out and one fellow said he could build the planes. He took orders for Sport 240s that day. In a few months we had some planes , some rules and we were off to the races. Kits were ordered from All American Kit Cutters. Others made their own and I cut out 2 kits. We were set and away we went. I kept in contact with Cliff, and we set up the first Off course racing here in Florida, as we beat Madera in having the first race off course. In 1993 we laid out the building rules (never changed until this year. Over the years, we have tried all kinds of starts, pace plane, first off is pace plane, draw straws for first off, race horse starts and staggered starts and various methods of clock starting. At last we have a workable starting method (see flying rules) We strive to meet all AMA rules regarding pylon racing and insist on safety at our field. We have fellows from other parts of the State flying with us and hope others will join with us. At the years end we have what is called the cash/point race, (see scrap book for photos) We award plaques at each race, and they gather points through the year for the last race. Money is awarded for the first 3 places in the Gold and Blue class and for the years winners in both the Gold and Blue class. This year (2005) we expect to award over $1000.00 dollars, and as more join in the pot grows each year ! You ask why the sport 240/300 ? Well it's a great first giant scale plane, a darn good Sunday flyer, and IMAA legal. It fits many occasions and is relatively inexpensive to build , but most off all it is fun to race and easy to fly. Try it, call one of our contact persons and get involved.